Dan Hartman's Twin Cylinder wonder! I was scanning the net one day, looking for more LEGO engine designs when I stumbled across Dan Hartman's homepage where he "casually" mentioned his single cylinder steam engine built from LEGO blocks. With my enthusiam for his project, he quickly coughed up some more pictures, designed a twin cylinder, took photos of it, made an animation, and a .WAV file for your listening pleasure. 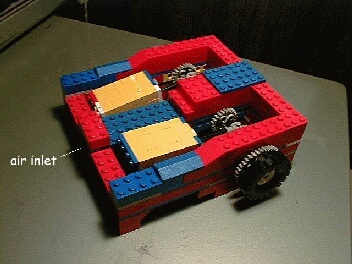 This has got to be the simplest LEGO engine design yet and I think it's an absolutely genius design. Click on the above photo to see more about his LEGO engines!